Cleopatra VII was born in 69 BC - 68 BC and was the last pharaoh of Ancient Egypt. When her father Ptolemy XII died in 51 BC, Cleopatra ruled jointly with her two brothers. Eventually she became sole ruler. Mark Antony was in dispute with Julius Caesars son Octavian over the succession to the Roman leadership. In 41 BC he began both a political and romantic alliance with Cleopatra. Their combined armies fought Octavian's forces. Octavian was victorious. After believing the Cleopatra was dead Mark Antony took his own life and Cleopatra chose the same course. She committed suicide on 12 August 30 BC and Egypt became a province of the Roman Empire. This wallet type packaging has a reproduction Denarius of Mark Antony held in a blister on the front. 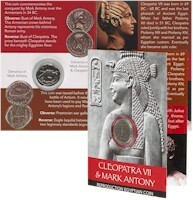 On the inside and reverse there is information about Antony & Cleopatra. Gold plated pewter reproduction of a Greek owl coin supplied on a gold chain. The information on the reverse of the card describes how Greek mythology appears on Greek jewellery designs and coinage.